Making My 4th Doctor Costume: Four Frock Coat - finished! My trip to NorCon earlier this month gave me the chance to wear my full Fourth Doctor costume for the very first time. The boots had only been finished a couple of days before-hand, as was the hat. It drew a lot of complements and I’ve been asked to post some better pictures of it. 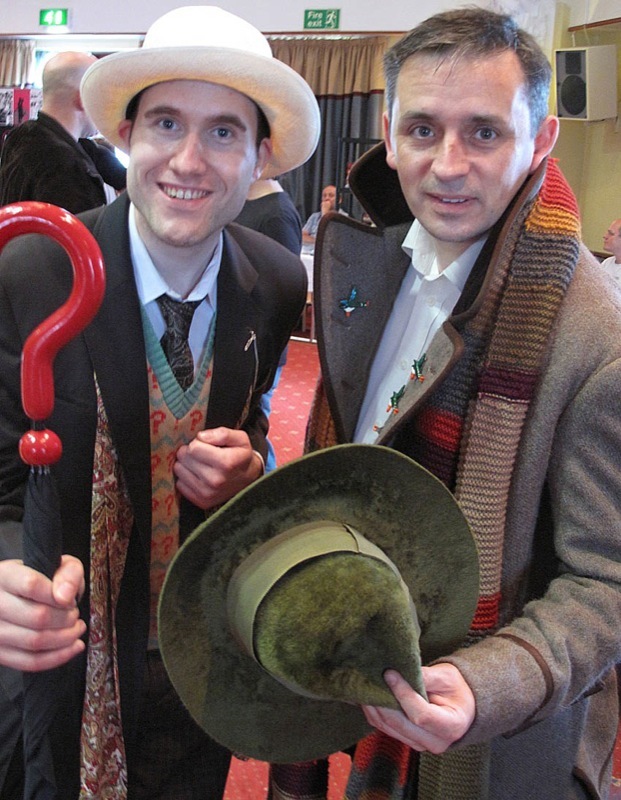 I took a load of photos, which I’ll post soon, but for now here are some choice shots showing the coat to its best. It looks amazing! Especially the cut of the lapels and collar so that it looks right when flipped up. One thing I am curious about though is the color of the tweed. Is it that same kind of taupe that looks different tan or grey depending on the light and presumably filming equipment? Oh, and also I gotta know where you got those boots. The colour of the coat is matched as closely as possible. I took a fist full of swatches to the exhibition to find the right one. The real coat is browner than you'd think, not as grey as it seems. I'm gonna blog about the boots soon - they need a separate entry to show them off properly. Oh my God! This is beautiful! When are you going to start having these for commission? Just one thing, the back pockets look slightly too large, but I don't have a lot of great views of the back to reference. P.S. I love your Dalek. Email me direct and we can discuss a commission. I agonised over those pockets. They looked fine on my pattern - too small on my calico test - and I agree, a little large here. Always room to revise the pattern though. Live and learn! I really admire your coat and especialyy your sklills. 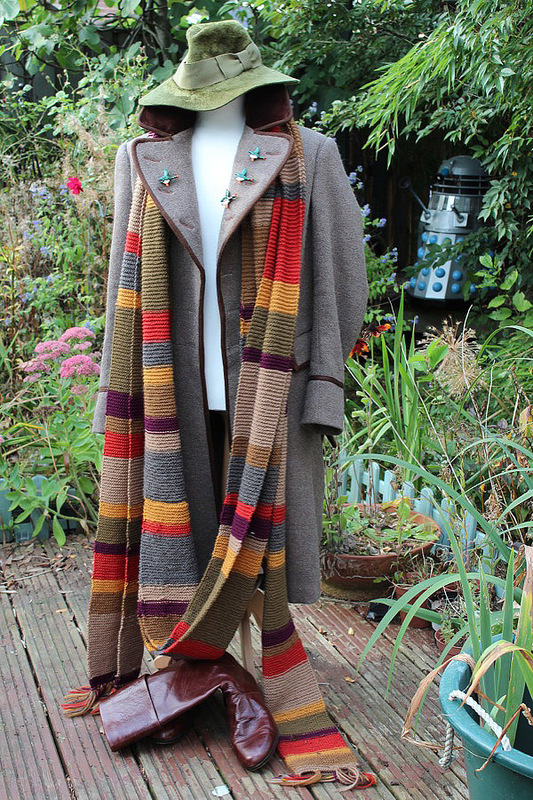 Is there any Chance I can lay my hands on the sewing pattern, cause I would love to have such a coat for the next FedCon cosplaying the 4th Doctor. I have a good taylor at Hand who can make the alterations so the coat would fit a woman. I'm sorry, but it's a bit rude to praise my work then ask for the pattern so you can take it elsewhere to be made. Just so you know (and any one else reading) I do not ever share my patterns under any circumstances whatsoever. I work as a bespoke tailor and to hand over my designs would be career suicide. Please do not ask again. Sorry didnt mean to sound rude, cause I really didnt ment to be. I have no prblems and can even understand it if you dont want to share, like a cook doesnt share his recipes. ANd now I search on, but your coat is really´a great one. The pins he didn't always wear (he had them in power of kroll) and I couldn't tell what they were. Ducks though hmm. Do you make the velvet frock coats? 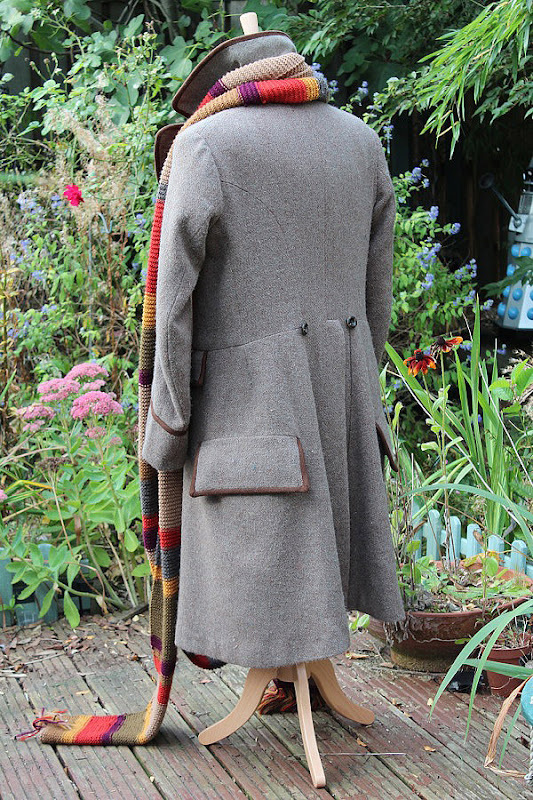 I do - I have a commission for a brown frock coat right now! Good time to order that, or the burgundy version too.